Located within walking distance to a grocery store and restaurants, Ecoute les Vagues sits right on Flamands Beach, giving guests easy access to swimming, snorkeling, and sunbathing galore. The villa itself has 3 bedrooms and 2 bathrooms, as well as a fully equipped kitchen and great room for relaxing and taking in the great water views. 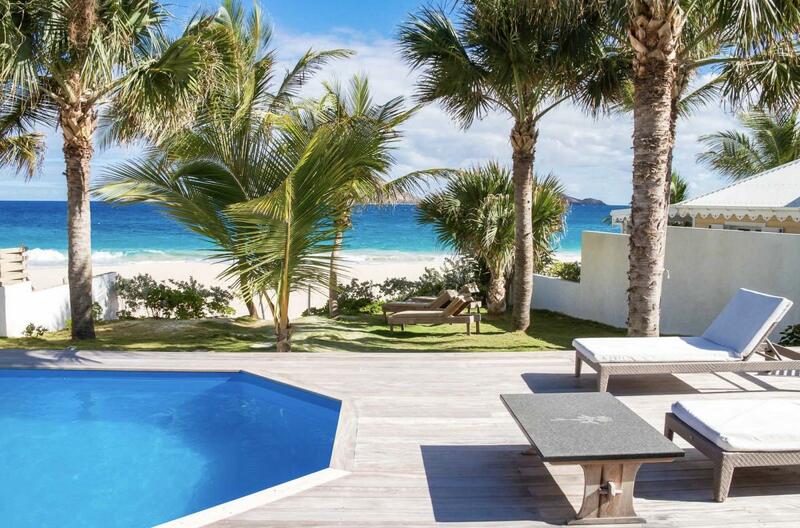 This contemporary villa has new furnishings that invite you to sit and relax while you’re indoors, but chances are you’ll spend much of your time out enjoying St. Barts and its great shopping, dining, watersports, and more. Ecoute les Vagues is perfect for couples, small families, or friends vacationing together. Perfect for a couple or family looking to share a beachfront villa. Ecoute les Vagues is a 3 bedroom, 2 bathroom beachfront villa located on Flamands beach. This is one of the most popular white sand beaches on the island. The villa is contemporary in style and offers 1 master bedroom with en-suite bathroom and 2 other bedrooms sharing the second bathroom. All bedrooms are furnished with queen sized beds and are all connected to each other and the great room from inside. The villa is within walking distance to a small grocery store, several restaurants, the Petite Anse beach which is great for snorkeling, and close to the trail to the famous Colombier beach. Bedroom 1 offers a garden view, queen sized bed, air conditioning, wifi, and a safe. There is an en-suite bathroom with shower, 2 wash basins, a hair dryer, towels and beach towels, and La Ligne de St Barth welcome products. Bedrooms 2 and 3 both offer queen sized beds, ocean views, air conditioning, and wifi with direct access to the front terrace. These bedrooms share the same bathroom with a shower, hair dryer, towels and beach towels, and La Ligne de St Barth welcome products. The kitchen is fully equipped, including a breakfast bar for 3, electric oven, gas stove, microwave, dish washer, fridge and freezer, toaster, coffee machine, blender, electric fruit squeezer, electric kettle, and food processor. There is service for 6 and a charcoal BBQ outside. The living room offers an ocean view and is cooled off by the ocean breezes (fans are also available). Decorations are contemporary and include a large sofa for 6 guests, a flat screen television with Dish Network, DVD player, ipod dock, wifi, and a desk area. The living room opens onto the front and back covered terraces. The main dining area is located on the front covered terrace, with a rectangular teak table for 6 guests. Another dining area is available on the back terrace with a round teak table for 4. There is a nice beachfront garden with tropical flowers and palm trees, and a comfortable hammock overlooking the water is the perfect place to relax. Dish Network, private parking, iron and ironing board, washer and dryer on request. Gustavia : 12 minutes • Airport : 10 minutes • Restaurants : 4 minutes walk • Grocery : 1 minute. The property is in walking distance to a small grocery store, restaurants, the Petite Anse beach which is a great snorkeling spot and from the trail to the famous and beautiful Colombier beach. There is a rental unit located on the lower level. My family of 4 stayed at this villa over spring break and absolutely loved it. The outdoor area is massive and the kids enjoyed waking up each day and immediately jumping in the pool. The name of the villa is fitting as once you open the doors to the patio you immediately hear the waves from the beach. The beach was basically empty the whole week aside from the late afternoon crowd of school kids who would come to boogie board on the waves. This beach is probably best suited for bigger kids due to the surf but our 7 yr old got into it a couple times to ride the waves. The villa is in a great location, very private, no traffic, no crowds on the beach and just a 10 min drive to St Jean or Gustavia. There is a housekeeper that comes during the week days which was nice as well and she lived in the villa just below. I’d definitely recommend this villa. Andrew and the WhereToStay process is great and they really ensure that everything is planned out and all your needs are met. I was very impressed compared to other sites I’ve used. Ecoute les Vagues is a beautiful villa with a beautiful view! The private pool made it even better! The housekeeper came in daily (except Sunday) and straightened everything up. I didn’t think we would need that but it was really nice to come home to a clean house every day. We are already talking about our next visit. Shawna was great to work with! So helpful! She replied to all of our questions in a timely manner. If she wasn’t sure about a question she found out for us and let us know. She listened to what we wanted and recommended Ecoute les Vagues and it was exactly what we were looking for. She helped us book our flight over from St. Maarten and she took care of booking our rental car. She made the process so easy! When you arrive at the airport in St. Barth there is someone there to welcome you and then you follow them to your villa. I look forward to working with Shawna again. I am so glad we came across WhereToStay.com.